It is the last week of National Safety Month and the National Safety Council is focused on driving safety. In this post, we will explore warehouse traffic and how to keep both drivers and pedestrians safe in the workplace. Industrial traffic almost always includes forklifts and pedestrians, but can include flatbed carts, utility trucks, and other types of power vehicles. The warehouse can get crowded with all the moving parts. Using administrative controls can help to direct traffic and keep workers safe. Yellow tape: Yellow floor tape is recommended for marking off aisles, lanes, and pathways. This color of tape can also indicate caution. Red tape: The color red signals danger or to stop. Use red floor tape around stop signs, fire protection equipment, and other areas that need to be avoided for safety and compliance reasons. Blue tape: Storage areas can be marked off with blue colored tape. This will ensure the areas are kept clear of vehicles and pedestrians. Striped tape: Use striped hazard tape to indicate areas of electrical hazards, a dead end, or a drop/falling hazard. Placing striped tape several feet in front of the hazard will give drivers ample amount of time to safely react. Nearly any sign that can be hung up on a wall comes in a floor sign option. From speed limit signs to way finding signs and stop signs, laying down floor signs to communicate messages clearly and ensure that forklift operators and others around the facility can easily see them. Forklifts and other vehicles often travel up and down aisle ways, moving throughout the warehouse and transporting inventory. Floor marking tape can clearly alert operators what is “too close” and avoid the hazard of bumping into shelves and knocking them over. The tape can be helpful to those stocking shelves, as it will indicate if something is sticking out too far. 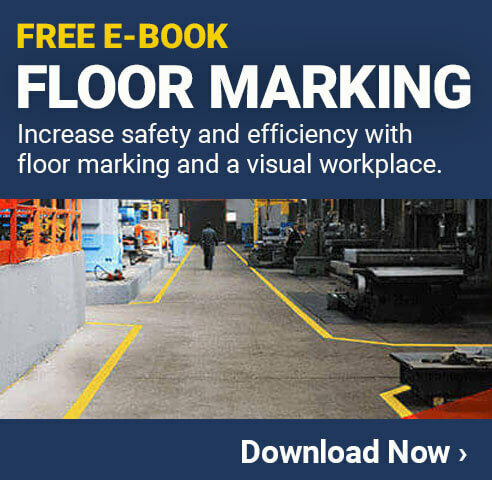 Aisle markings are also one of the only places where OSHA specifically identifies the need for floor marking and require tapes to be at least two inches wide. While lanes and speed limit signs are excellent options for traffic control, administrative controls should be in place for those walking around the facility floor. Crosswalks can be created with floor tape to let both pedestrians and drivers people of each other’s possible presence in the area. If people aren’t walking with their heads up and alert, floor signs can be an extremely effective means of communication. Floor tapes and markings do not come in only one type of material, and different materials can keep people even safer. If your facility has uneven or slippery surfaces, which pose slipping and tripping risks, you can use traction tape. If certain areas are not well-lit, use reflective tape to ensure it can still be seen by drivers. If you have specific pathways meant for emergency exits or evacuation routes, photoluminescent tape will glow in the dark and lead workers to safety. As we end this year’s National Safety Month with driving safety, think about those driving and walking around your warehouse. Just by using floor marking stickers, tape, shapes, and signs you can create a safe traffic environment for everyone in the workplace.